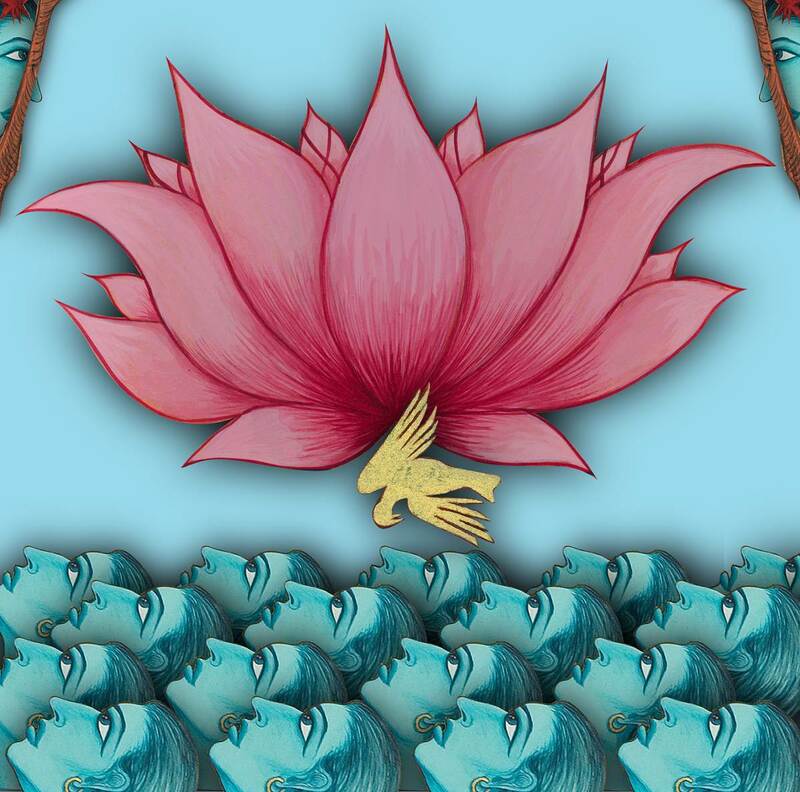 We spoke with artist Siona Benjamin, a LABA Fellow presenting her new work, “The Four Mothers Who Entered Pardes,” at LABAlive presents MOTHER: Power on March 16th at the Theater at the 14th Street Y. The art installation includes four cathedral-scale mixed media panels exploring the journey of the four matriarchs as they enter the Pardes. The installation will also feature dancing by Bhavani Lee and music by Galeet Dardashit. Siona was humble enough to share her influences, process, and the effect being a LABA Fellow has had on her personally and artistically. 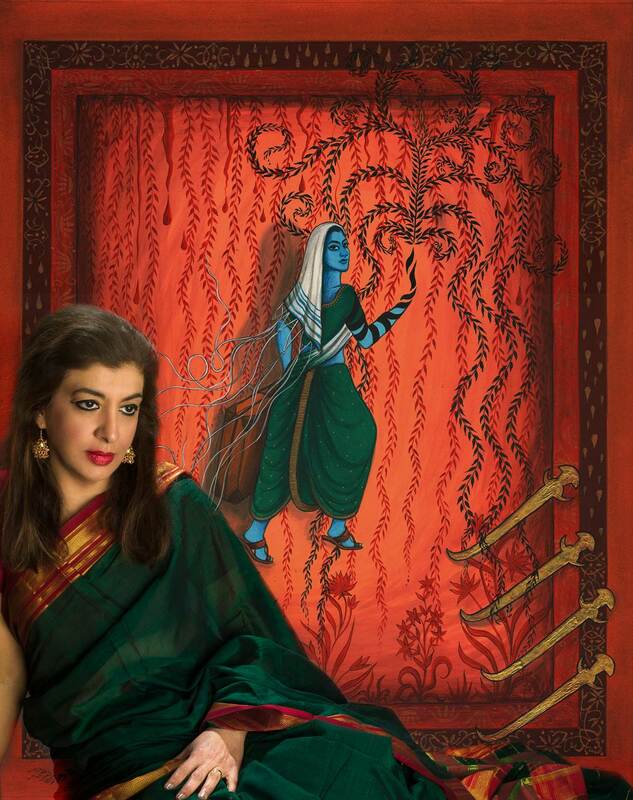 A: I am an artist originally from Bombay, India, of Bene Israel Jewish descent. My work reflects my background and the transition between my old and new worlds. Having grown up in a predominantly Hindu and Muslim society, having been educated in Catholic and Zoroastrian schools, having been raised Jewish and now living in America, I have always had to reflect upon the cultural boundary zones in which I have lived. In this trans-cultural America and world, I feel a strong need to make art that will speak to my audience of our similarities, not our differences as I feel I can contribute to a much-needed “repair” (Tikkun) through my art. I would like my audience to re-evaluate their notions and concepts about identity and race, thus understanding that such misconceptions could lead to racism, hate and war. Q: You have so many influences. Can you describe your pieces and your process? A: I use gouache and gold leaf on paper and wood. I am inspired by traditional styles of painting, like Indian/Persian miniatures, Byzantine icons and Jewish and Christian illuminated manuscripts, but I blend these ancient forms with pop cultural elements from our times to create a new vocabulary of my own. Using the rich colors of gouache I apply layers, literally with the paint, as well as metaphorically with the content. My painting is my ritual, my celebration, my essence. My research and ideas flow simultaneously together and make up the fabric of my work. I use gouache paints and 22K gold leaf to form layers of jewel like color. My background in painting, enameling on metal and theater set design all influence my work. My characters are real as they act out contemporary situations and dilemmas, while also celebrating my womanhood, my abilities, my strengths and my ambitions. The ornateness of the culture from which I came once seemed difficult and unnecessary to apply in my work. Now I have found a way to use it, to be able to weave current issues and parts of my life in its intricacies, thus making this ornateness strong and meaningful. In this way, I attempt to create a dialogue between the ancient and the modern, forcing a confrontation of unresolved issues. Q: To sum it all up, what is one word that describes your work? Q: How has being a LABA fellow informed your trans-cultural work? A: The exciting process of learning midrash, collaboration, and meeting amazing new artists has influenced me. Also, the power of myth and recycling this mythology to make it relevant today is informing to my work. 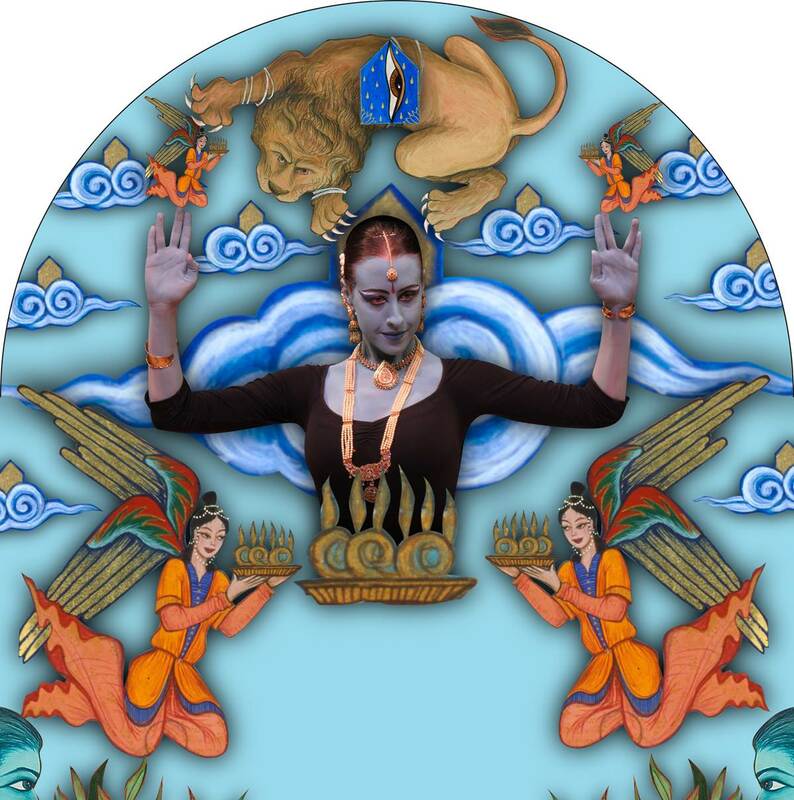 See Siona’s installation, “The Four Mothers Who Entered Pardes,” at LABAlive presents MOTHER: Power on March 16th at the Theater at the 14th Street Y. The evening will include a teaching with Ruby Namdar and two theater premiers by LABA Fellows Clemence Bouloque and Sigal Samuel. Tickets are $18. The evening will run 90 minutes with wine, snacks, and schmoozing to follow. Click Here for More Information and to Buy Tickets. All The World’s a Stage – Including the Classroom! We sat down with Ashley Renee Thaxton, Assistant Director of the Teen Theater Summer Camp here at the 14th Street Y to talk about her love for theater, for camp, and theater camp here at the Y! I will be graduating from NYU’s Gallatin School of Individualized Study this May, with a concentration in Double-Conscious Performance: Intersections in Acting, Dance, and Critical Race Theory. I have an incredible love for performance that facilitates dialogue about issues of race and representation, as well as Golden Age musical theater and Black American theater history. As a teaching artist, I have worked with young performers of all ages and taught in California, New York City, and Accra, Ghana. I’ve been here at the Y since my freshman year, first as an intern with LABA, but I’ve also worked the Service Desk, different Y special events and I’m now incredibly excited to be the Assistant Director of the Teen Theater Summer Camp! What’s so great about theater camp? 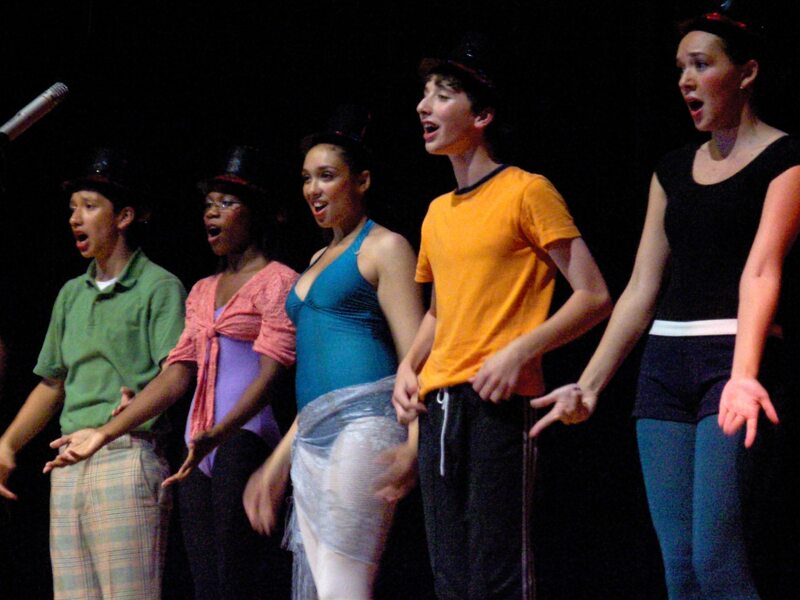 Ashley is the furthest to the right, from a performance of “One” from A Chorus Line in 2007. 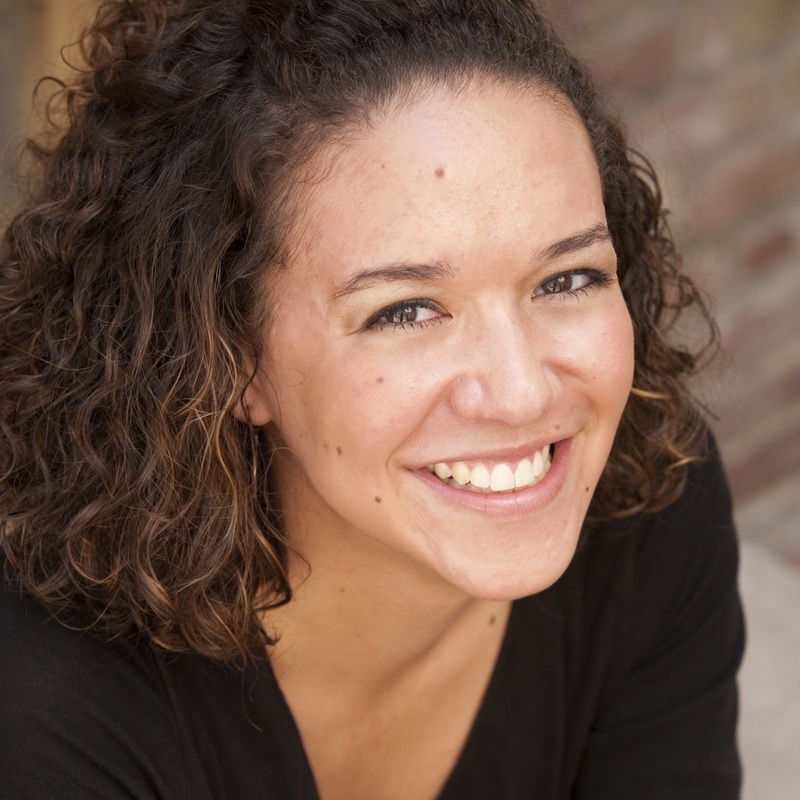 Next to her is one of her best friends who also moved to NYC to puruse a career in theater! I spent nearly every summer of middle and high school with the Pasadena Musical Theatre Program in my hometown of Pasadena, California and I can honestly say that it was one of the most formative experiences of my childhood. Through PMTP, I grew not only in my love for theater and my technical skills as a performer, but I came to truly understand what it meant to be an effective communicator, and not just because there was no money in the budget for microphones some years! I was told that everyone had a unique voice and talent to share and that encouraged me to approach everything I did with confidence, not just performance. I was able to transition to leadership positions within PMTP in my last years of high school and first years of college, and this shaped my love of the theater to include teaching artistry, directing, and stage management: jobs I have come to love and have shaped my professional career. Also, most of the childhood friendships that I have maintained since coming to college 3,000 miles from home are with the friends I have from PMTP, and I only spent summers with them! What makes camp here at the Y special? 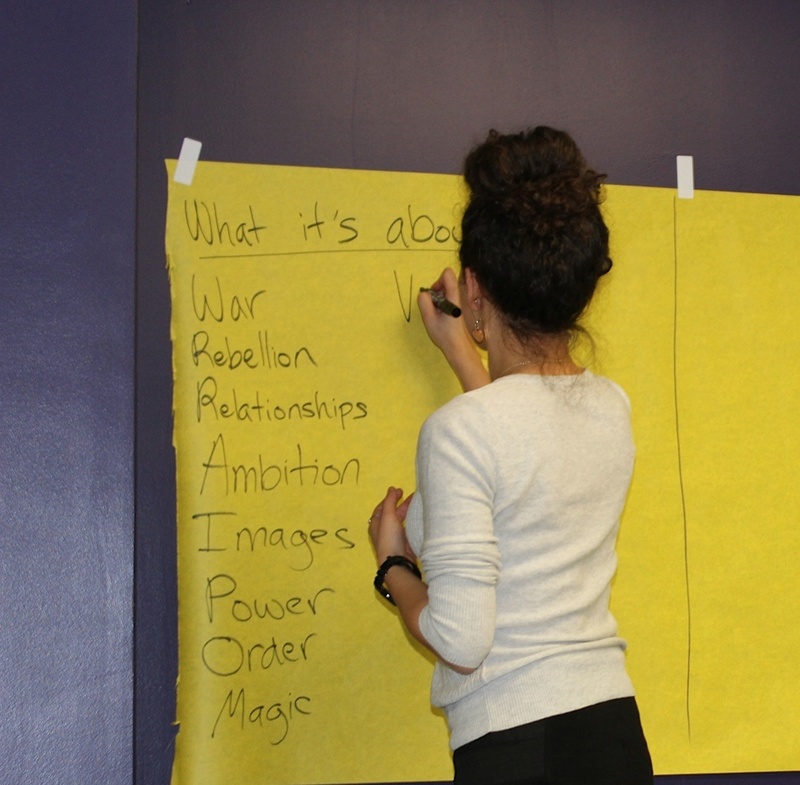 Ashley facilitates a workshop of themes for an all-female production of Shakespeare’s Julius Caesar. Those of us spearheading the teen theater programming here at the Y place an incredible importance on creating a sense of community and support for our students. We have all spent time in different theater camps over the years, and have brought with us best practices, teaching styles, and unique special interests. So many training programs for young artists create competitive and high stakes environments that can break you down more than they lift you up. We believe that the most growth — artistic, emotional, or personal — is possible when a young person feels supported and valued. We also give our teens the opportunity to explore all different facets of the theater, from musical theater to Shakespeare to playwriting to directing to clowning, which contributes to their development as multi-disciplinary artists. If you’ve never set foot on a stage before, if you’re counting down the days until you win your Tony Award, or if you’re somewhere in the middle we want to work with you! Our Counselor-In-Training program for the Teen Theater Summer Camp allows for highschoolers to take their involvement in theater to the next level: gaining expereince in directing and peer leadership while still growing artistically themselves. So how do I get my child involved? We have two amazing camps coming up for young artists of every age! Join the 14th Street Y and the exciting, innovative MCC Theater Company in a one-of-a-kind spring break experience! Students will learn acting, improv, public speaking, and more, and get to experience being in our professional black box theater. *Separate tracks for elementary and middle school age students. * Flexible scheduling for families. Register for up to a full five days of programming. Our programming partners: Amas Musical Theatre, MCC Theater, and Red Fern Theatre Company will provide discipline-specific instruction in the areas of musical theater, acting, playwriting, Shakespeare, and more! The 14th Street Y will teach various master classes, including training for high school and college theater program auditions. Those who have completed grades 9-12 participate as Counselors-In-Training, which includes advanced acting classes, and leadership training. 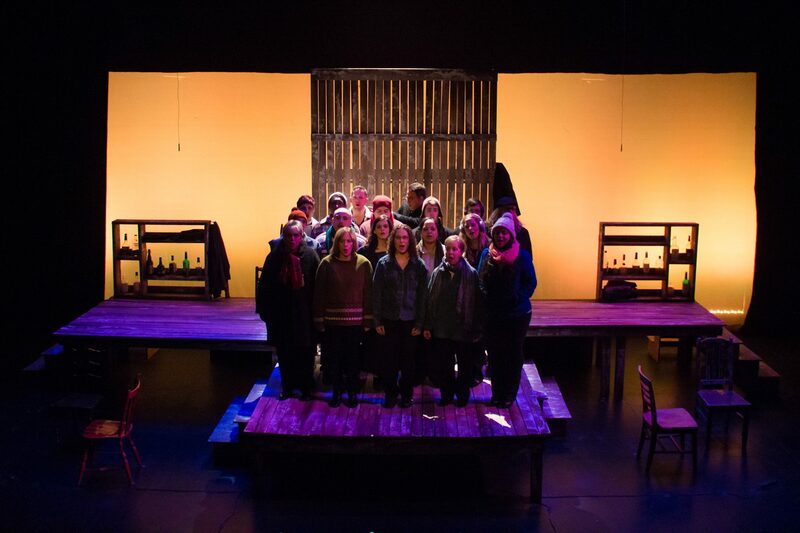 In addition to working with young people, Amas (which means “you love” in Latin) has cultivated new and diverse voices in American musical theatre, including over 60 professional productions. In this week-long program, teens gain expertise in acting, dancing, and singing techniques, with emphasis on how these skills all come together to create a musical theatre performance. The week will conclude in a showcase of skills learned for family and friends. And check out a video about camp, featuring Director Becky Skoff and our students from last summer! 14th Street Y Theater Camp Video from Case Aiken on Vimeo. A few months ago, I asked Y members “Wanna be in a show?” and confessed that after 12 years of professional work behind the scenes, I missed performing. So I answered “Yes!” and give AfterWork Theater Project a try. 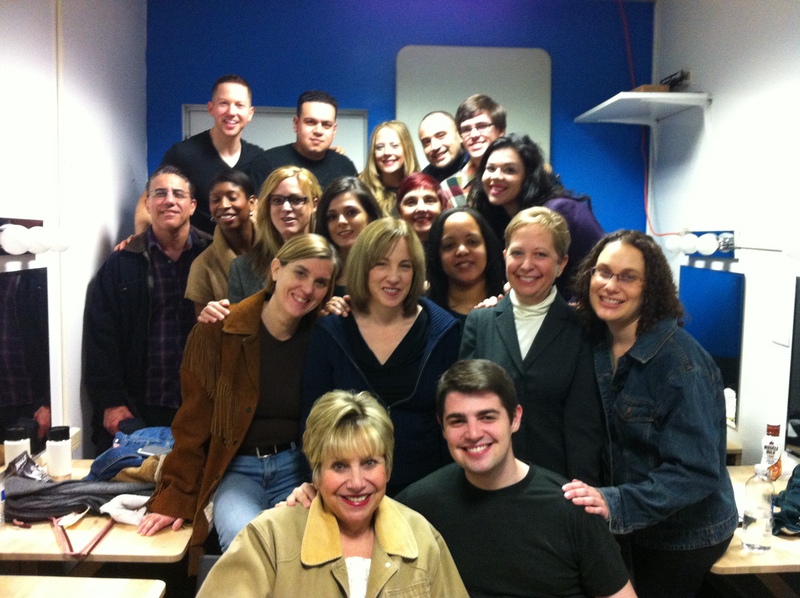 Last weekend, I made my NYC debut in The Laramie Project on the 14th Street Y stage. I invited friends,family, and co-workers (even my boss!) to come watch. And it was amazing. AfterWork’s mission is to provide working adults an opportunity to take the stage with the goal of fun, community, and creative self-expression. When I signed up in October, those were my only goals. I wanted to recapture the fun and magic of being a part of a show that I had enjoyed throughout childhood and college. I didn’t realize that as an adult, I would be gaining so much more from the experience. First, as an adult, we get so few chances to really challenge ourselves. Doing this play, while balancing my full time job, was an enormous undertaking. Some days I would work for 8 hrs, have a half hour break, then rehearse for four hours, get home late- then wake up and do it again. Memorizing lines and complex blocking seemed harder for me than I remembered from high school. Many times I wondered, why I chose to do this? However, participating in AfterWork was one of those experiences that reminds you, the greater the challenge, the greater the reward. I was able to physically, mentally, and emotionally challenge myself on every level. When opening night came, and I stood center stage in front of a packed house to deliver my big monologue, the feeling of pride and accomplishment that came over me was priceless- worth every second of hard work. Becky Skoff delivers her heartfelt monologue with the cast. The second breakthrough for me was reconnecting with my creative side. We all possess this creative side, and are encouraged to nurture it growing up, but it is often abandoned in favor of other priorities in adulthood. When was the last time I had allowed myself to really play, explore, and experiment? As inhibitions faded during the rehearsal process, I felt myself growing emotionally. Exploring my characters, which ranged from a drug addict, to a young women discovering her destiny as a political activist, to a Mormon home school teacher, forced me to connect with myself, and my own dreams, demons, and challenges. I had forgotten that connecting with characters inevitably leads to connecting with yourself. Finally, going in to the experience, I could never have imagined that the cast and creative team of this play would be so amazing. We were a diverse group of people in every way, including our ages, ethnicities, professions, and theater backgrounds. For many, this was their first play, or their first play in many, many years. When we committed to the play we also committed to each other, and I have never felt so close to a group of people, so quickly. I miss them already. This fall, the 14th Street Y will be deepening our partnership with AfterWork Theater Project, and they will become of first Adult Theater Education Partner. We’ll be offering classes, new programs, and more opportunities to perform on our stage. I just had a unique, fulfilling, and exhilarating experience. Next year, I hope you’ll join me! Click here for more information about AfterWork Theater Project!